So, we bought a house. I know what you're thinking, "I didn't know you were looking!" Long story short, we came across a beautiful investment property and thought, "Well, why not?" So here we are, with a 1930's bungalow and nearly seven acres of deep, dark woods, which, might I add, are populated by herds of deer. The place is in need of major loving. Most of the house falls somewhere in the range of "not so nice" and "extremely hideous." Take, for example, the front door, which I have oh-so-lovingly nicknamed the Alice in Wonderland door because it leads down the rabbit hole of all sorts of curiosities. 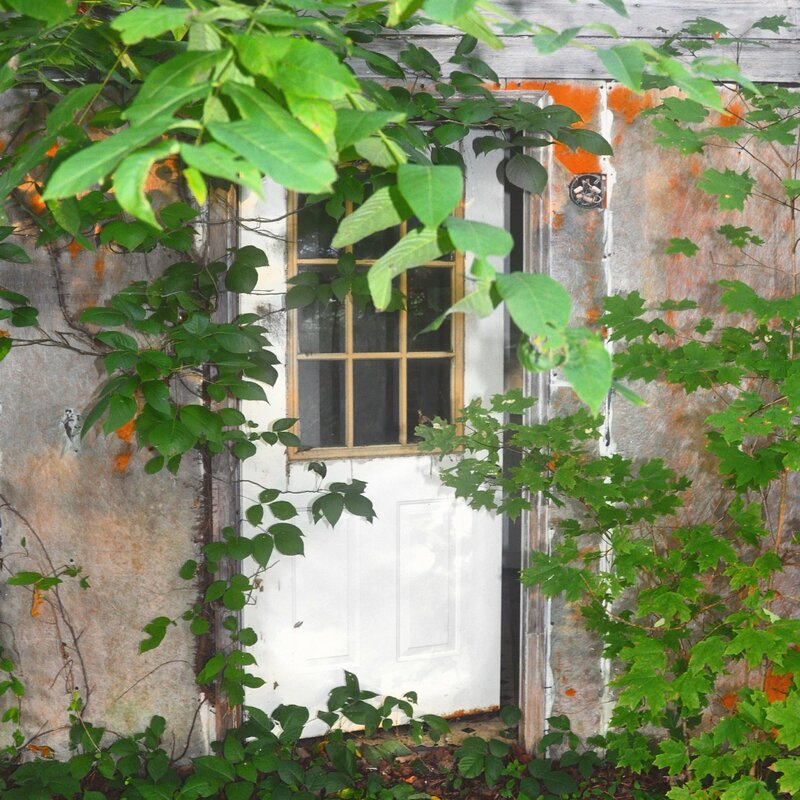 But sometimes – before everything is replaced with the shiny and the new – sometimes you just have to pause and appreciate how beautiful even a decaying, decrepit door can be when a flowering vine winds its way across the facade. As terrifying and overwhelming as buying a house can be, I am over-the-roof excited about this particular challenge. I am pinning away ideas like a madwoman, sketching house plans like a pro and already driving my poor, unsuspecting husband insane with my gazillion and one ideas for the space. But before I get too carried away, it's probably a good idea to establish a plan. You already know my affinity for making checklists, so I figured I'd start with that. My hope is that a home renovation checklist will help me plan the complete scope of the remodel and, fingers crossed, eliminate the possibility of blowing our budget out of proportion. The idea is not to add unnecessary items to the remodeling plan, but rather to consciously rule them out up front, so that I am less likely to spontaneously add them later on in the process. I realize not all of you are in the process of purchasing or renovating a home and thus will likely find the information below useless. If that is the case, I hope you'll take a minute to share in my joy and excitement, bookmark this page for future reference, and be on your merry way to more exciting adventures. Otherwise, I would love your input, your personal tales of home renovations and anything else you feel like sharing with me today. A great place to start is my list of 10 Best Home Decor Sites to Bookmark Now. Like any upstanding woman of the world, I’ve been keeping a Pinterest board of design ideas I love long before this house was on the horizon. If you’re lucky like me, you may not be able to afford the majority of ideas that you pin, but you have to start somewhere, right? So why not start with the styles that most appeal to you? Are there any family events, vacations, holidays, looming weather shifts or major life changes that should be taken into consideration? My hope is that establishing a timeline will help prevent the renovation from dragging on forever, as is often possible with construction projects. Ask friends and colleagues if they can recommend any professionals, and look closely at the quality and type of work they have done in the past. While I wait patiently for my husband to iron out these details, I’ve started working up several of my own home plan drafts, so that by the time a professional is brought onboard, I’ll have a concrete list of rooms, their ideal sizes, finishes and number and position of windows and doors. You’re about to experience a whole lot of stress – there’s just no way of putting it nicely. In our case, a safe space entails a rental where we can live comfortably during the duration of the renovation. Sure, it’s an added cost, but when you consider the alternatives, it’s a cost I’m willing to pay for a little peace of mind. If you’re remodeling one room at a time, it could mean selecting a room that will remain relatively untouched by the chaos and equipping it with whatever you might need to keep yourself sane. I hope you'll join us on this wild and crazy adventure! Sign up for the FOXY OXIE newsletter to be the first to know about our progress – plus fun DIY tutorials, before & after photos and so much more! Pingback: Do You Ever Feel Guilty for Decorating Your Home? How lovely! Can’t wait to see how you renovate! 7 acres? That’s pretty awesome. I recently bought a house too, so 100% congrats! Well, in that case: CONGRATULATIONS! It’s such a big and exciting milestone! Are you feeling all sorts of feels right about now, because I sure am! It’s very intimidating yet very exciting, and I can’t wait to get started with this challenge! Congratulations on your first home! Can’t wait to see how you fix it up! Congratulations on such a huge milestone! I’m not in the same boat quite yet but I’ll keep these in mind! Popping over from September Issue! Hi Hillary, it most definitely is a huge milestone! I’m feeling all sorts of feels right about now! (Insert monkey-covering-its-face emoji). Congratulations on the purchase! It sounds lovely and challenging and rewarding. Excited to follow this journey of yours!